As a senior in college, I have come to think of this time in my life as a stepping-stone between childhood and adulthood. You are given freedom, but are not yet required to be completely independent. We often don’t realize how much we rely on our universities to provide us with essentials. Personally, I did not realize how much I relied on my school until Superstorm Sandy hit. 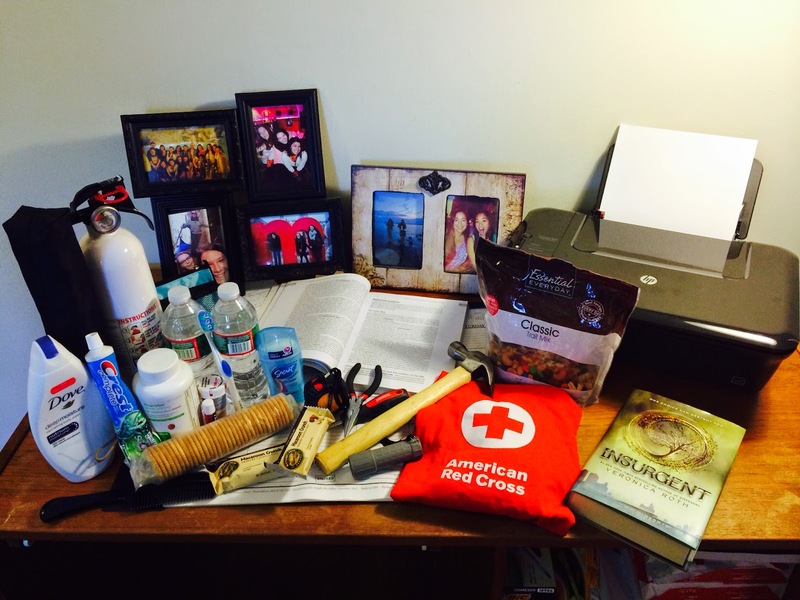 Until Sandy, I had never thought about what I would do in the face of a disaster at college. I have distinct memories of my 19-year-old self, perched atop my bunk bed, listening to rain pound the window. The lights flickered frequently, threatening to die; all I had to eat was a bag of tortilla chips. I was completely unprepared. The school lost power, the dining hall could not be kept open, and my friends and I found ourselves confined to our dorm rooms while the storm raged around us. After talking to my friends who attend other universities, I realized this was not an uncommon experience. While universities are equipped to deal with disasters, it is equally as important for students to prepare. During my junior year, a major snowstorm hit, leaving me (I was now living in an on-campus apartment) without power. Being without light meant there was a mad rush to purchase battery-powered lamps, leaving many students without alternative options to light their apartments. I lost most of my refrigerated food. The school urged everyone to go home, but since I did not live a convenient distance, that was not an option. A few of my friends considered going to a nearby hotel for the night. As a freshman, I laughed at my parents when they insisted I keep things like a flashlight in my dorm room. Now I realize how truly important those things are. Keeping items like a flashlight, extra batteries and a small portable lamp in your dorm are essential when it comes to emergency preparedness. Even food is important to keep in your room, just in case the dining halls are unable to serve you. My experience has definitely taught me that as we go about our busy college lives it’s important to stop for a second and think about if we are truly prepared. It was shortly after the celebration of America’s Birthday ended when a devastating fire ripped through the 6500 block of Gesner Street in Southwest Philadelphia. The raging fire destroyed or damaged 10 homes, leaving 42 residents without a place to stay. Sadly, 4 children did not escape the fire. This was a tragedy that stunned the entire community. Red Cross workers, some who had just worked nearly 20 hours at the Wawa Welcome America events along the parkway, responded to assist a neighborhood in grief. Volunteers provided blankets, water, hugs, support, comfort and counsel in the early hours of July 5th. A reception center was set up nearby at Bartram High School where more than 2 dozen residents registered. By Sunday afternoon, Red Cross had provided financial assistance to 10 families, 33 people… 18 of who are in our care staying at Red Cross House. The Red Cross will continue to provide assistance to other families who may come forward in the days to come and will continue to support those families in grief over the loss of these children. First, please consider making a financial donation to local disaster relief to allow the Red Cross to have resources constantly available to respond to disasters like this one and to continue to provide support to the families affected by the Gesner Street fire. You can d this by calling 1-800-RED CROSS or by clicking here. Liberian Association of Pennsylvania, Inc.
Also, consider joining the Red Cross as a volunteer to respond to disaster like this one. We are always looking for dedicated people. You can learn more and sign up by clicking here. Joining the Red Cross SEPA Team! As AmeriCorps National Preparedness & Response Corps (NPRC) members, we have had the opportunity to take a variety of American Red Cross training courses over the past few months. These trainings have given us the tools needed to prepare and respond to local and national disasters, and have helped us become a part of the Red Cross SEPA team! One of my favorite trainings so far, was learning Client Casework. During this day long training session, we were able to learn how to properly carry out client services-skills we can apply to both local and national disasters. Our team was able to conduct practice interviews, assess client needs and determine the appropriate assistance. This training was especially helpful to me during my first rotation at the Red Cross House. While at Red Cross House, I was able to implement client services at a local level by helping families get back on their feet following a disaster. Becoming certified in driving and using the equipment on the Emergency Response Vehicles (ERVs) was another exciting AmeriCorps NPRC training. The Emergency Response Vehicles help the Red Cross respond to local and national disasters ranging from house fires to hurricanes. Learning how to properly operate and drive an ERV is an important part of being a Red Cross disaster volunteer. These vehicles are essential to disaster relief operations. ERVs are used to provide mobile or stationary feedings, distribute items, and, as necessary, perform casework and transfer supplies. To prepare us for safe ERV driving, we all completed an online defensive driving course before taking the road test. Members also learned how to safely handle and serve food that will be delivered to clients through an online training. I look forward to perhaps one day operating the ERV on a national deployment. We all passed the road test! Our team also became CPR & First Aid certified through the American Red Cross. In addition to the classroom trainings, AmeriCorps NPRC members have the opportunity to sign up individually for American Red Cross trainings in areas we may wish to specialize in when responding to national disasters. I look forward to taking more training courses that will advance me in Client Casework, as I enjoy carrying out client services. Joining the Red Cross SEPA team has been an exciting opportunity and I look forward to taking more trainings in preparedness and response at the upcoming Pennsylvania Disaster Training Institute on October 25th-29th.